Heart Disease Diet: Do You Have a "Wheat Belly"? Low HDL cholesterol, high triglycerides, small LDL particles: the most common triad of abnormalities today behind heart disease. Along with this pattern comes high blood pressure, high blood sugar, diabetes and pre-diabetes, increased inflammation, increasingly blood clot-prone blood. This common collection that now afflicts over 50 million Americans goes by a number of names, including metabolic syndrome, insulin resistance syndrome, and syndrome X. But I call it "wheat belly. " Let me explain. 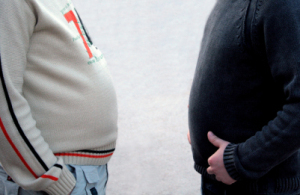 You've heard of "beer bellies," the protuberant, sagging abdomen of someone who drinks excessive quantities of beer. Wheat belly is the same protuberant, sagging abdomen that develops when you overindulge in processed carbohydrates. It represents visceral fat that laces the intestines. While nearly everyone knows that candy bars and soft drinks aren't good for health, most Americans have allowed processed carbohydrates, but especially wheat products like pretzels, crackers, breads, waffles, pancakes, breakfast cereals and pasta, to dominate diet. I blame the extreme over-reliance on these foods for the obesity and related abnormalities: wheat belly. Back in the 1960s, we had sandwiches on white bread, hamburgers on white flour buns, spaghetti made with bleached, enriched flour. Data from the 1970s and 1980s, however, demonstrated conclusively that using whole grains, with the bran and B-vitamins left in, was better: better for bowel health, blood pressure, cholesterol values. Fast-forward to the 1990s and the new century, and the mantra has evolved to "eat more whole grains, eat more whole grains," repeated by "official" organizations and propagated by countless media conversations. And Americans have complied. But while video games, unhealthy snacks, and vending machines have been roundly blamed for the nationwide epidemic of obesity and diabetes, it's curious that increased weight has befallen even active people who eat "healthy": yes, plenty of whole grains. In my view, it is the grains that are largely behind the obesity and diabetes epidemic, at least among the frustrated health-conscious. But not all grains. Oats and flaxseed, for instance, seem to not contribute to weight and the associated patterns like small LDL. The wife of a patient of mine who was in the hospital (one of my rare hospitalizations) balked in disbelief when I told her that her husband's 18 lb weight gain over the past 6 months was due to the whole wheat cereal for breakfast, turkey sandwiches for lunch, and whole wheat pasta for dinner. "But that's what they told us to eat after Dan left the hospital after his last stent!" Dan, at 260 lbs with a typical wheat belly, had small LDL, low HDL, high triglycerides, etc. I thought so, too, 12 years ago when I followed a strict vegetarian, low-fat diet, rich with "healthy" whole grains. I gained 30 lbs, my HDL dropped to 27 mg/dl, triglycerides skyrocketed to 350 mg/dl, small LDL went crazy, my blood pressure was 150/90, and I developed diabetic blood sugarsâ”€while running 5 miles a day. It's the wheat. I eliminated the wheat and promptly reversed the entire picture. Most people will report that a cloud has been lifted from their brain. Thinking is clearer, you have more energy, you don't lose in the afternoon, you sleep more deeply. You will notice that hunger ratchets down substantially. Most people lose the insatiable hunger pangs that occur 2-3 hours after a wheat-containing meal. Instead, hunger is a soft signal that gently prods you that it's time to consider eating again. You may even find that you miss meals, just because you forgot to eat. Very curious.